Klarna Checkout for WooCommerce is a plugin that extends WooCommerce, allowing you to take payments via Klarna. This plugin integrates with Klarnas latest platform (v3). You need an agreement with Klarna specific to the new platform to use this plugin. Klarna Checkout is available in Austria, Denmark, Finland, Germany, The Netherlands, Norway, Sweden, United Kingdom and the United States. Step-by-step guide on how to switch from old plugin to new Klarna Checkout for WooCommerce plugin. An embedded checkout solution works a bit different than a regular payment method. Here is a visual guide to describe what happens when during a purchase. Read more about available hooks in the Klarna Checkout plugin. Klarna Checkout supports recurring payments via the WooCommerce Subscriptions plugin. Here is a guide to help you get started. It is recommended to enable guest checkout (Enable guest checkout setting in WooCommerce > Settings > Checkout). If you don’t allow guest checkout you must check both Automatically generate username from customer email and Automatically generate customer password in WooCommerce > Settings > Accounts setting page. Make sure that you disable the Display returning customer login reminder on the “Checkout” page feature in WooCommerce > Settings > Account. When the customer clicks the Place order button in Klarnas iframe the purchase is completed and this plugin will then trigger the start of WooCommerce checkout process. No error handling of required form fields are available in this step. Go to: WooCommerce > Settings > Checkout > Klarna Checkout. Enable Klarna Checkout by checking the Enable Klarna Checkout checkbox. Description – Enter the description of the payment method displayed in the checkout page. Separate shipping address – Tick this checkbox if you want to allow customers to use a shipping address that is not the same as their billing address. Other payment method button text – Customize the Select another payment method button text that is displayed in checkout if using other payment methods than Klarna Checkout. Leave blank to use the default (and translatable) text. Shipping details – Additional shipping information that will be displayed to customers in Klarna Checkout iframe after they have placed an order. Allowed Customer Types – Select if you want to sell both to consumers and companies or only to one of them (available for SE, NO and FI). Date of birth mandatory – Tick this checkbox if you want to make it mandatory for customers to enter their date of birth during checkout. Based on your store base location and the countries you are selling to, you will use one or both of these sections. By adding merchant credentials to a specific region (Europe or the United States) you also enable Klarna Checkout as an available payment method for that region. Note that you need an agreement with Klarna for each region enabled. Title mandatory (GB) – Check this to make customer’s title mandatory, only works for customers based in GB. 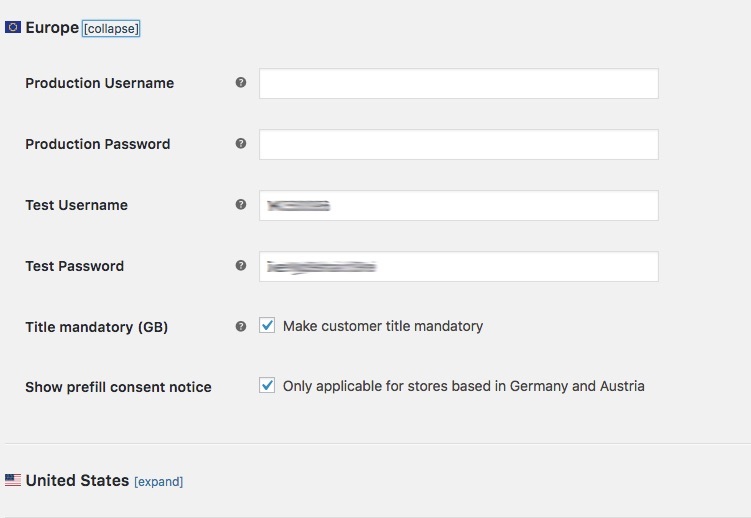 Show prefill consent notice – Check this to prevent logged-in customers’ data from being sent to Klarna, only applicable for customers from Germany and Austria. Offer local payment methods for AT/DE/FI/NL customers – Checking this will offer local payment method to customers from each of these countries. If these options remain unchecked, only card payments will be available for customers from these countries, when checkout out with Klarna Checkout. With the Color settings section, you have the possibility to alter the appearance of the Klarna Checkout iframe displayed in the checkout. Here you can change things like background colors, button colors and text colors. Klarna Checkout is compatible (in Sweden, Norway, Finland, Germany & Austria) with the WooCommerce Subscriptions extension for handling of recurring payments. Read more about recurring payments with Klarna here. Klarna Checkout should be the first/default payment method (if multiple payment methods are active). This can be adjusted in the section Payment methods in → WooCommerce → Settings → Payments. The Klarna logotype should be visible on the website (for example in the footer). More info and logos can be found here. With an embedded checkout like Klarna Checkout, the order is created in Klarnas system first and in the next step the order is created in WooCommerce. To follow the standard WooCommerce order creation process as much as possible, the WooCommerce checkout form is being submitted even with purchases made via Klarna Checkout. If something goes wrong during this process, there are 2 different types of fallback routines that might get triggered. An error is triggered when the checkout form is being posted. Similar to when a user tries to place the order but have forgot to check the terms and condition checkbox. If the checkout_error js event is triggered by WooCommerce, the KCO plugin creates the WooCommerce order programatically (with the cart as the reference). An order note is created with the following message:This order was made as a fallback due to an error in the checkout. Please verify the order with Klarna. If no order is being created in WooCommerce at all during the checkout process, Klarna sends an API callback 2 minutes later. If the corresponding Klarna order ID doesn’t exist in WooCommerce an order is created programatically (with order lines in the Klarna order as the reference). An order note is created with the following message:Order created via Klarna Checkout API callback. Please verify the order in Klarnas system. More detailed information about the entire checkout and order creation process can be found in the Integration flow cart here.